You will laugh. You will scoff. You will be befuddled. But I have finally figured out why Obama is so familiar. At first I thought it might just be his politics. In my day job as a political philosopher, I recognize deep similarities between Obama’s political orientation and a tradition of American progressivism that had its heyday in the early 20th century. This form of progressivism had roots in the Midwest and was linked to the Social Gospel Movement. In some ways Obama is reviving this tradition. But there was something more familiar about Obama, and about how his campaign has managed to galvanize so many young people. Well, maybe it was simply a flash from the past, the political organizing that many of us engaged in to stop the Vietnam War and for Civil Rights. He is leading a movement in which people of color and whites are linked once again. Perhaps this was the source of the deep familiarity. Yes, certainly, his campaign has brought back memories. But it somehow didn’t get to another level of familiarity. And then it hit me. Obama is Mr. Spock and his campaign the Star Ship Enterprise, that is, if you allow for the vicarious presence of millions of fans aboard the ship. 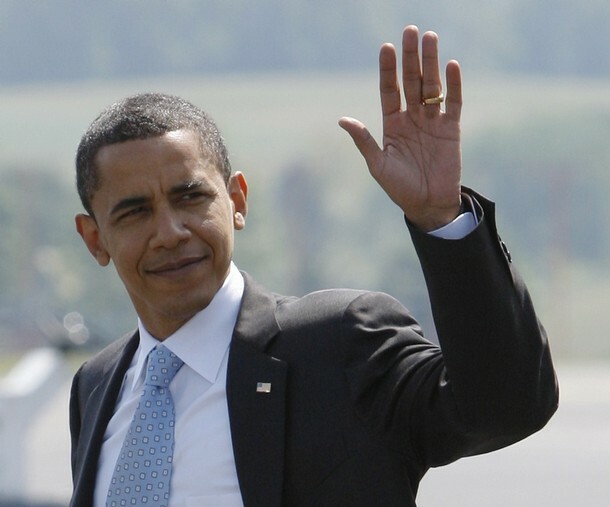 Consider Spock and Obama: cool, logical, trustworthy, a great deal of presence of mind, etc. 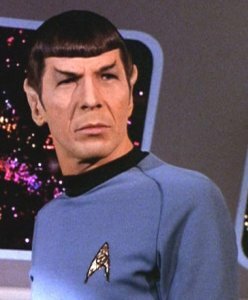 Further, Leonard Nimoy, the actor who plays Spock, is Jewish. Obama went to Harvard Law and taught at the University of Chicago Law School, which makes him an honorary Jew. (Being Jewish, I can say this.) And what have we heard about Obama’s blood pressure, 90/60; not that of an ordinary mortal, just like Spock. But don’t consider character traits, or arguments, gaze on their images. We must broaden our horizons. It is not merely the similarity to Spock. Star Trek ran during a war that most of us could do little to stop. Here we are, once again. (And there is a Texan in the White House, again. Don’t get me wrong. I lived in Texas. I am fond of Texans. I married one. But let’s just keep them out of the White House for the Next Generation.) Star Trek was a fantasy refuge, before the Internet. But Star Trek was going to be canceled by NBC. What saved it? According to William Shatner, Captain Kirk, in Chapter Three of his book, Up Till Now (don’t ask how I know this), a letter writing campaign was launched to save the show. Here is what Shatner tells us about the campaign. Okay, you will accuse me of trivializing one of the most important recent movements in American politics. But Obama the community organizer would understand the connection. Star Trek was a collective experience mediated by a visual medium. It also expressed utopian ideals at a time when young people felt impotent about changing the course of a war and the world. (Star Trek began before the full impact of demonstrations against the war became apparent.) Obama and his people have harnessed the Internet to allow people to feel that they are not mere bystanders but full participants. They have provided a sense of “ownership” (although I am not crazy about the term). Most importantly, and here the analogy begins to break down, Obama and his team are providing not only a fantasy utopian moment, but the possibility of actually changing things. Live Long and Prosper. P.S. Leonard Nimoy is an Obama supporter. Ridiculous and damned funny. Gotta grub some food but I’ll be back to read the rest of this preposterous piece of hilarity. One original Trekie who can appreciate this. Not sure if the hip Obama can relate. Or maybe two generations. I know there will be limits to what Obama can change in 8 years. Obama is a Star Trek fan. He even said this in Wyoming. HE said he grew up with Star Trek and he believes in the final frontier. I grew up with Star Trek. I wrote one of those letters. What Star Trek meant to me back then was that we had a great, exciting future ahead of us, and that people of all colors and genders were going to be part of it. It may seem like nothing now, but it was unique then. There was an Asian guy like me on board. There was a Black lady like my neighbor on board. There were people with unfamiliar accents on board, just like people from my neighborhood. OK, so we didn’t have any aliens in my neighborhood. The wino who hung out on the corner acted pretty spacy sometimes, though. 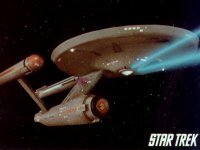 If Obama’s campaign is the USS Enterprise, Beam Me Up, Scotty. I’m ready. You’re not so crazy. 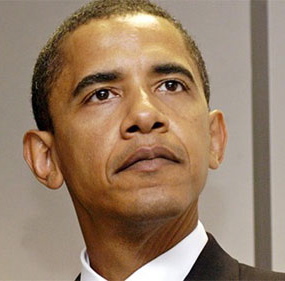 I have heard Obama compared to Tuvok (ST: Voyager) at least once. Obama is a trek fan and a Spock fan to boot check out this video of Leonard Nimoy talking about meeting Obama at Democratic Fundraiser in 2006. They need to get some of these. I, too, wrote a letter. I, too, stood for change then and stand for it now. After all, the human adventure is just beginning. What about Benjamin Sisco? Cool leader, taken for an emissary. Especially the episode where the entire DS9 seems but a dream of a black artist who drawed DS9 for a sci-fi magazine. 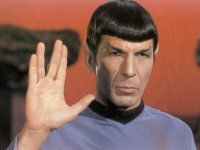 Spock was also mixed-race, so he knew about both sides. I remember watching the series of The Enterprise. Mr. Spock was a man of great self-confidence and determination, as I recall. Interesting that you make the comparison. Must be careful though, there are some who would now call Senator Obama a space alien! I am excited about the young senator of Illinois being in the presidential race; he has certainly brought millions of people together, White, Black, Asian, Hispanics, Native Americans, Spanish, of all ages, all walks of life, and of all backgrounds. He is solely responsible for the HUGE turnouts to vothing booths and caucuses. He has run the very BEST campaign and the very BEST fundraising in U.S. history; he has also been recognized as the BEST fundraiser in U.S. history!! I have every confidence that when the senator wins the election and takes the helm of our country he will be the BEST leader of our beloved nation and the BEST Commander-in-Chief of our military forces. This man has something special that has been lacking in our Presidents for decades: That is VISION. We saw it when he gave his 2002 speech against going to war in Iraq!! And he called it RIGHT, down to the effect the war would have on our economy! McCain has NO such vision; he had the Iraq War as an easy war that would not last very long. In 2004 he said we were winning the war and that the war would be over soon. McCain = NO vision, NO leadership, NO plans and NO preparation past the downfall of Saddam. McCain is EXTREMELY SHORT SITED. May we (hopefully) all live long and prosper. Don’t forget the epic “Obama Spock” action figure. Only one handmade figure in the entire world. 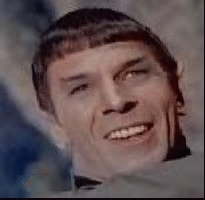 > I became a Trek fan in 1966. I wrote 4 letters to Paramount. I made up 3 sisters to improve the odds. > I campaigned for George McGovern in New Hampshire when I was 18. I saw him at the debate. > I met Leonard Nimoy in the 1970s and 1980s at ST conventions and plays. He owns one of my photos. > I studied under Dr. Aboulafia in Houston. I learned a lot and loved it a lot so I had to sneak it in here. > I call myself Engineer Torres because I admired the ST Voyager character, the actress has Puerto Rican heritage, and, as a NASA contractor, my title was Staff Engineer. Torres is my real name. The International Space Station support team was likened to the Starship Enterprise, which would mean I worked in the back room like Engineering. It’s my brand (I don’t like the term. Being in Texas, it has a painful connotation. > I can’t seem to come up with an Obama connection.